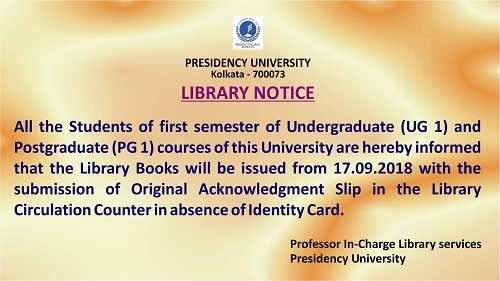 The Presidency University Library has a very unique and rich collection of books, periodicals and manuscripts as well as multimedia resources built over nearly two hundred years. This includes some of the rarest reference materials along with thousands of important documents and journals. The University Library comprises two main units - i.e., - the Arts Library, the Science library alongside the individual departmental libraries. With the vast stock of old and rare books as well as the growing maintenance demands, plans for further infrastructural development and expansion are underway. The primary mission of the library is to support the educational and research programs of the University by providing access to rich physical and digital repositories of learning resources. With its rare archives and the most current databases, the University library is designed to cater to the University's current and future teaching and research interests. Multidisciplinary resources useful for History, Philosophy, English and Performance Arts departments. ProQuest Dissertations & Theses Global (Trial up to 30th May 2016). Proquest E-Book Central (Trial extended up to 30th May 2016). Date: 5th April, 2016 (Tuesday). 8th March, 2016 1.30 PM -5.30PM. Students/Faculty/ Researchers are hereby requested to fill the following Registration Form before 28th February 2016 to get the access to National Digital Library of India (NDL). For details of NDL, please visit https://ndl.iitkgp.ac.in/ and http://webcast.gov.in/nkn/iitkgp/. are now accessible from Presidency University Campus. is now accessible from Presidency University Campus. Date of submission: 25th August, 2015 (Tuesday) to 11th September, 2015 (Friday). No rare books will be issued from the library for borrowing purpose. It will be issued for the purpose of reading.